Helping you realise your child's full potential. No matter the age or ability, Kumon is there for you! Kumon is an educational method which uses Maths and English skills to develop the potential of each child. The aim of Kumon is to unleash each child's potential to love learning, by improving confidence and self-esteem, and encouraging self-discipline and a good daily study habit. There is no failing in Kumon. Kumon Programmes take a linear approach to learning. A concept is introduced with simple exercises, then work gradually increases in difficulty in very small, incremental steps. Aims to make high school Maths easy. Students with strong reading comprehension ability read passages quickly and accurately, and grasp their meaning with ease. Writing numbers up to 120. Each child starts at a point where they are comfortable, ensuring that a solid foundation is laid for more advanced study. This builds confidence, self-esteem and success right from the start. Students are required to do Kumon every day for between 10 and 30 minutes. Nurturing good study habits, time management and goal setting brings confidence and the freedom to tackle any problems. Good study habits are instilled, improving concentration, accuracy, fluency and a positive attitude to learning. 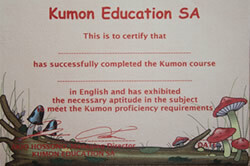 Competence through daily practice is the essence of Kumon. Students are allowed to practise each new concept until they are really competent. This level of fluency at each stage ensures that there are no gaps in their understanding of the materials covered and that their level of confidence is maintained as they progress. Being able to work quickly and accurately builds a growing sense of achievement and enables your child to tackle more challenging work with confidence. Building a brighter future for your child means equipping them with the knowledge and skills they will need both at school and throughout their adult life. At Kumon, we develop self-learning abilities by guiding students to think for themselves, all within a structured and motivational environment. They become confident, independent and able to take responsibility for their own learning. At Kumon we believe in recognising students' achievements through regular and specific praise and motivation. Each student is awarded with an Achievement Certificate on successful completion of a Kumon level and Kumon has an Advanced Student Recognition Programme for those students who surpass grade level. Kumon continually revises their learning materials to meet the current needs of children. Kumon's materials allow students to study work which is two or three years above their own school curriculum level. Students can practise until the step is thoroughly mastered. Then the next step is introduced, building on the foundation established by the one before.